Caleffi DiscalDirt Air and Dirt Separator with 1 inch Sweat Connection - 546096A. 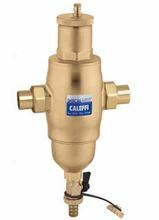 Caleffi Air and dirt separators are used to continuously remove the air and debris contained in the hydronic circuits of heating and cooling systems. The air discharge of these devices is very high. They are capable of automatically removing all of the air present in the system down to the microbubble level. The Caleffi DISCALDIRT air and dirt separator also removes any solid impurities in the system. 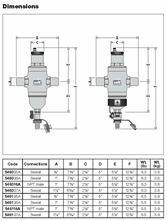 The impurities collect at the bottom of the device and can be flushed through the integal drain shut-off valve. The circulation of fully de-aerated and cleaned water enables the equipment to operate under optimum conditions, free from noise, corrosion, or mechanical damage.